A visit to The Rake Bar on Sunday 9th January 2011 proved to be one of my beery highlights of the year, and it was quite a year (more posts to come on that!) so that says a lot. The occasion of course was the launch of the Kernel Brewery/Glyn Roberts Black IPA, described as an homage to one of Glyn's favourite beers of 2010, 21st Amendment's Back in Black. I went along with my fiancée as something of a celebration as we'd got engaged on New Year's Eve and that morning had been along to Hatton Garden to buy the ring. I find that good beer is enhanced by good company and perhaps something to celebrate and as it turned out, this was a great beer which needed little help in that regard. The afternoon passed by in something of a blur. The Rake may be a small bar but the outside patio area and covered section of Borough Market, behind the patio, means it can hold lots of thirsty drinkers and boy were they thirsty that day! Both kegs of Kernel Black IPA were killed in no more than a couple of hours total and my ordering halves in respect of the 6.8% ABV meant I only managed about 4-5 halves before it was all gone. As it transpired, Glyn drank most of it, for Quality Assurance purposes one assumes! A quick google will find many reviews of that first batch. Here's a good one from Dave Lozman. It was as good in bottle as it was on keg that day and Kernel went on to brew a second and third batch, tweaking the recipe as they went with the ABV increasing to over 7%. I hadn't even heard of 21st Amendment until then, despite having lived in the San Francisco area and being a regular visitor, so I made a mental note to check them out next time I was over and boy I was glad I did. In October of 2011, I found myself sat in their restaurant in the SOMA district of San Francisco, staring into a glass of the beer which inspired the fantastic Kernel rendition. Now, having already spent a week drinking some very hop forward west coast IPA's, my tastebuds may have been somewhat attuned to the might of US C-hops but it seemed less hoppy and perhaps more smooth than the Kernel version, with the roasty notes of the malt playing very nicely with the flavoursome hops. It wasn't overly bitter but had a nice, yet subtle, hop kick on the finish. It's brewed with Columbus as the bittering hop with Columbus and Centennial being used for flavour before being dry hopped with Centennial and Simcoe. The floral, citrus notes of the former and the piney notes of the latter were both apparent on the nose and the glass didn't last long as I explored what was an excellent beer. I took the opportunity to buy a six pack of cans to bring home. The artwork taken from their website is very eye-catching and I must say their branding is fantastic throughout their range. The opportunity to taste Back in Black alongside that first Kernel batch was one I was never going to get, which is a shame. However, I was able to taste it alongside the 3rd batch which I believe was brewed in November 2011. 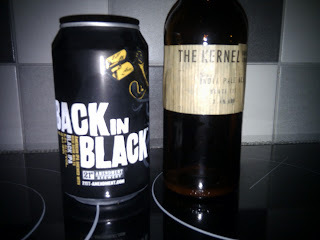 The can by that stage was a couple of months old with the Kernel Black IPA III being slightly younger. Tasting them side by side confirmed my thoughts from back in October. The first difference is apparent on the nose. The Kernel beer leaps out of the bottle up your nostrils, filling them with the floral, piny aroma you'd expect from an Kernel IPA. Back in Black requires a bit of swilling and sniffing to pick the same notes up but they are certainly there. The mouthfeel of both is a rich, luxurious one but they do taste quite different. The 21st Amendment brew offers more prominent roasty and coffee flavours with the hops sitting nicely alongside whereas the Kernel one is much more hoppy up front with the 'dark' flavours coming through later. Both are very good beers and good examples of the black IPA style but for me, being the hop monster I am, the Kernel homage just edges it. Beer is all about opinions of course and I like to share good beer, talk about it and hear what others think. 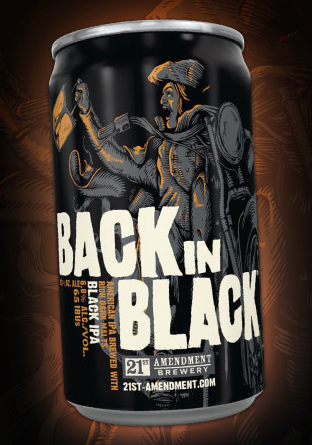 I've got one can of Back in Black left (can't be many of those in the UK) and will happily share it with a fellow UK beer lover. 'Follow' this blog with google friend connect on or before 8th January 2012 to be in with a chance. I'll draw a name from a hat on the 9th and contact the lucky winner for postage details. I only ask that you tell me what you think! Raven got my nod for best beer of last year (one I kept going back to) and it's fair to say I like all three. The dry hopped (centennial) version of Raven they had in cask at Euston Tap was especially good. I think the use of Nelson Sauvin in Raven gives it a lovely berry 'fruitiness'. Getting thirsty now! Raven might have to be one on my list to aim to clone. My first two planned beers are the Galaxy IPA and a Fullers ESB clone. Well I didn't have a hat to hand so had to resort to a list and the Excel RAND() function, but lucky winner of the can, in an ironic twist, is @rabidbarfly!